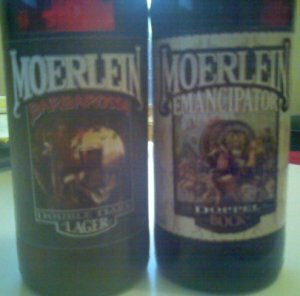 I got these two bottles of Moerlein beer in a trade way back on Dark Lord Day. To the stranger that gave them to me, I’m sorry it took me so long to try them! First up: the Barbarossa Double Dark Lager. The bottle points out that it is named for Holy Roman Emperor “Barbarossa” Frederick I of Germany. I can only assume that by “Double Dark Lager” they mean a double, or heavy, version of a German black lager, or schwarzbier. It pours an almost clear, deep caramel with a creamy khaki head. The aroma is delicately malty, with a sweet caramel character and notes of fresh biscuits. There is also something of a metallic tinge to the aroma, probably because these are twist-off caps and the beer has been slightly oxidized. The taste: remarkably clean. Dry, with touches of caramel malt flavor and toast. Again, there is the slightest bit of oxidation, likely my fault for treating this beer badly and drinking it old. The palate is wonderfully dry, with a smooth but not overpowering carbonation. I could easily have another. By the way, this one has left thick rings and serious honeycomb lacing on my glass. On to the doppelbock. Here, Emancipator refers to the “emancipation of America’s honorable brewing tradition” in 1933. Emancipator pours a dark auburn with a similar creamy tan head. The nose is pretty strongly metallic, which again I will attribute to cap-related oxidation. I can still get a strong roast malt and burnt coffee aroma. The first taste is thick and very creamy. Later, I can pick out some of the roast flavor, but it is much too sweet. I feel like my mouth has been coated, and not in a good way. The metallic character cuts through the sweetness more than the malt flavor. Very cloying. This entry was posted on Tuesday, October 28th, 2008 at 17:54	and is filed under European Lager, Strong Beer. You can follow any responses to this entry through the RSS 2.0 feed. You can leave a response, or trackback from your own site.